In this article, We are going to explain spring boot datasource example. Spring boot make configuration easy to setup datasouce connection, With few configurations, we can connect to database to perform operations. To setup database connection using spring boot requires some basic dependency like spring-boot-starter-jdbc dependency requires for JDBC connection and another dependency for related database Drive. 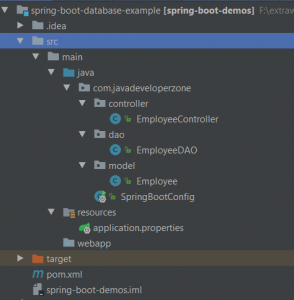 It contains spring-boot-starter-jdbc for spring boot database library and mysql-connector-java for MySQL driver library both are required to connect spring boot with a database. Database connection related properties stored in application.properties. application.properties is a standard file of spring boot application which contains all configuration related to spring boot application. Remember that application.properties must in your call path root or resource directory properties. It’s spring boot startup file. There is no extra configuration related spring boot datasource. A controller will take require from a client and send all Employee List list will be fetched from the database. Its important part of communication with a database. Here JdbcTemplate is @Autowired which automatically find out datasouce. Using JdbcTemplate we can perform communication with database and perform operations with database. In this article, We learn that how spring boot make database connection easy with minimum configuration and make our development easy and fast.